The storage shelf downstairs where I stored old paint was a mess. But worse was what I found in those stacked paint cans. 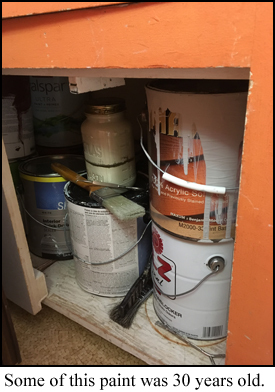 Prying up the rusty lids on a few, I found a good half-inch of congealed paint. In others was separated paint pigment from water. 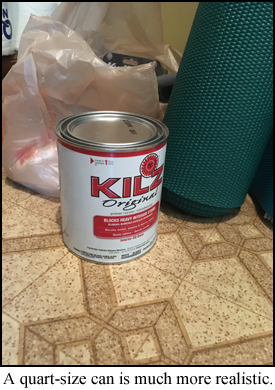 In one can, no matter how hard I shook and stirred, I couldn’t bring the paint back to the original color. I painted a few small areas of the kitchen pantry where young boys had clipped around a corner, but now on a wall that’s country cream, I have milk polka dots. Who names paint anyway? Our living room is elephant tusk. I guess Dorian Gray never gets old like Oscar Wilde’s character. 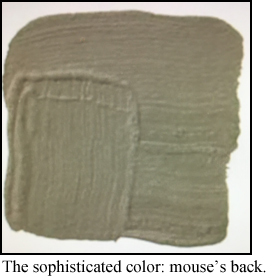 I’ve never bought mouse’s back, but I’ve looked at the brownish olive-gray. Last straw is actually a pretty sunny color, somewhat like our old country cream. But most of our old paint is named outdoor white or ceiling white. I don’t think of the color names, but the books I listened to through the years as I painted. (I painstakingly washed my hands before changing those library-loaned CD disks.) The living room ceiling was The Eagle Has Landed by Jack Higgins. The bathroom was Rosamunde Pilcher’s September. The carport was Updike’s Rabbit, Run. The outside benches were painted to Ayn Rand’s Atlas Shrugged. But I digress. Why did we keep all this old paint and how could I get rid of it? From reading the city’s recycling brochure, I knew I couldn’t just put the cans in the trash cart or I’d be in big trouble. Pouring the paint in the woods was not an option. Although I shoot my B-B pistol at the squirrels on the birdfeeder, I couldn’t poison the animals that call the woods their home, nor could I pollute the ground water. Son Landon asked a contractor friend if we could get some sawdust from one of his construction sites to put in the paint and dry it up. But it turned out the contractor had a deal with the paint store he patronized, so he took all twentysome cans of paint and turned them in where they could get a decent and legal disposal. The contractor said paint is good for about three years, but after that it’s not going to be the same color, not going to cover well, nor bear up to spot scrubbing. So now I’m going to start over. Instead of buying a gallon because ounce for ounce it’s cheaper than buying a quart, I’m going to buy what I need for a painting job. Really, who needs a gallon of Kilz when you only use it to conceal a few stained spots? And I’m actually thinking of painting an accent wall in one room—you guessed it—mouse’s back, and I’ll listen to my latest download from Audible, Amor Towles’ A Gentleman in Moscow.